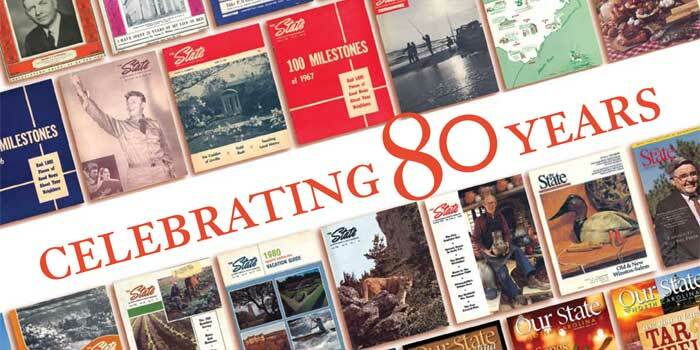 Our State magazine celebrates its 80th anniversary this June. We look pretty good for our age, don’t we? Eighty years is a long time. Since Our State began as The State on June 3, 1933, we’ve created 2,046 issues. In that time a few things have changed, some stayed the same, and the mission of the magazine holds true: to celebrate the people, places, and culture in North Carolina. To honor our 80th anniversary, we’ve compiled some exclusive content for our fans and readers. Click through the links below to see it all. Watch this special message from Our State Editor in Cheif Elizabeth Hudson. How well do you know Our State? Take the quiz and find out. Show us some love. Print off this PDF, take a photo of yourself holding it, and upload it to our Facebook page at facebook.com/ourstatemagazine. This wasn’t an easy list to put together. Read our top 10 favorite stories of all time. See a gallery of our covers through the years. We thought about scanning all 2,046 covers, but decided to narrow it down to 39. We’ve never been at a loss for words. Take a look inside the pages of our earliest issues. What about your memories? When did you first subscribe to the magazine? Do you remember Carl Goerch? Share your memories with us in the comment section below.